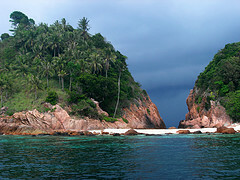 The Emerald island in Malaysia: Pulau Redang, situated 50 km off the coast, is the most developed island in Terengganu. Then there is the beautiful Pulau Perhentian, a haven for nature lovers and those who enjoy scuba diving, deeo-sea fishing, wind-surfing, sailing, boating and canoeing. Also beckoning visitors are Pulau Tenggol, considered to be Malaysia’s best diving spot and Pulau Lang Tengah where there is an abundance underwater marine life.